New 500ml bottle size at the same price of the old 250/300ml bottle! Also known byt the brand name Star-San, Phosphoric Sanitiser is the most effective and fast acting sanitiser product available. It foams up during use however it is a no-rinse sanitiser and left over foam will break down and become a yeast nutrient. 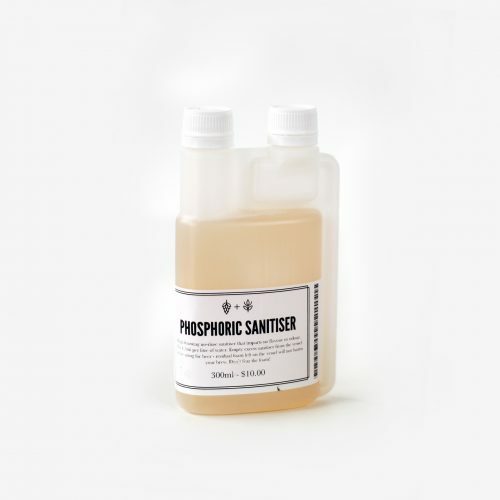 This is THE sanitiser we recommend for all brewers. Used as a no rinse it does not contaminate or add any off flavour to the brew. Due to high demand there is a limit of 2 per customer. This is a highly concentrated sanitiser and one bottle should be enough to sanitise a keg or fermenter hundreds of times. We may cancel and refund orders with more than 2 of these sanitisers.